opted to live and work in America. This is his first book. For obvious reasons, many of the names, and certain identifying features, of individuals who appear in this book have been changed, and details of certain operations and events have been appropriately disguised. In particular the names and addresses of IRA or PIRA personnel, or members of any other paramilitary organisation against whom internal security operations have been mounted, or with whom internal security organisations have had to engage, are not their real ones. It was not a simple decision for me to write this book. The pros and cons, political and personal, took several months to sift through my conscience. I abandoned the idea more than once, but each time the urge to write a revealing account of life in the Special Boat Service came back to nagat me. But if an accuratestory of the unit was to be written, one that examined its faults and excesses as well as its glories, its nobbersas wellasits heroes, it would have to include equally revealing stories of the Special Air Service since the two units are joined at the hip. There is an abundance of literature available to the public describing the greatness of the SAS, so I decided to illuminate some of their blunders, just to even things out a little. The SAS has remained unchallenged as the world’s finest special forces unit since its formation during the Second World War (except when it was disbanded for a few years after 1945). Since then it has sustained its superiority by constantly updating its skills, tactics and equipment, getting stuck into fights wherever it could to keep its edge, and maintaining a level of ability, in most climates and theatres of war, at least one step ahead of the competition. 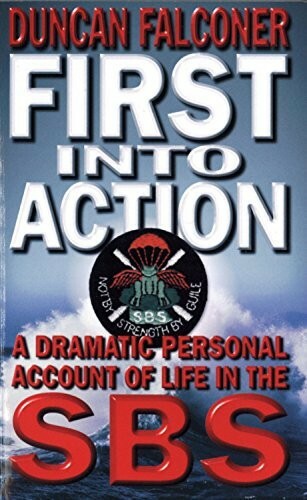 The SBS was formed at around the same time and might have maintained a similar prominence, but due to a lack of foresight from its leaders and support from its parent unit, the Royal Marines (a minuscule group compared to the Army, and more traditional and less flexible), it failed to keep up with the times and in so doing lost the confidence of the combined services’ commanders in chief. When a specialised military job came along, the SAS were the first, and most often the only, choice. At one time, it looked as if the SBS might never grow beyond a conventional beach reconnaissance support group with an unclear role at operating behind enemy lines. Had the SBS not changed its focus and begun to look as far as decades into the future, it might never have even seen action in the Gulf War, for instance, where it was selected to be the first into action. After the unit identified and focused on a specificarena (Maritime Anti-Terrorism), the SBS’s awesome improvements in skills and abilities have overflowed into other areas. Today, the SBS not only seriously challenges the SAS for pole position in the league of world special forces, it has gained the full confidence of the commanders in chief and taken over many areas the SAS once assumed were exclusively its own. In writing this book, initially wanting to play it safe (from a security point of view – I have no desire to be a whistle-blower), I first thought about drafting a collection of anecdotes, avoiding the politics, opinions and more sensitive material. But an SBS book, the first modern one written by an actual operative, that did not look under the covers to reveal the true character of the mysterious unit seemed pointless. I could not make the decision alone and sought advice from those whose opinions I most cared about – the men of the SBS itself. I chose men currently serving and others retired, a mixture of senior NCOs and officers, and introduced the book as a purely hypothetical idea to protect them from the Directorate of Special Forces (for reasons I explain later in this preface). I did not avoid consulting men who I felt certain would be against the idea. To my surprise, the vote to write the book was almost unanimous, the abstainers being unsure. Of the dozen I talked to, none gave an absolute thumbs-down. It was impossible to get the views of the entire unit but I was confident I had a majority opinion. That does not mean the book has the blessing of the SBS. The SBS recently (unofficially) sponsored the publication of an official history of the unit that contains more hard facts about the SBS than my book, but it is a characterless record and skips all the juicy details – understandable since it was written by a civilian and edited by a rupert (our affectionate nickname for officers). The reasons against such a book as this are obvious. The SAS, having produced somewhere in the region of thirty books by actual operatives, have blown so many whistles that their reputation within the corridors of power has been tarnished by the publicity it has attracted – all publicity for special forces being bad. The reasons I got from the SBS members who approved of my book idea hovered around a central point which was rebellious in nature. The target of their dissent was the Directorate of Special Forces (DSF). In 1997 DSF made it compulsory for every serving member and new recruit prior to selection to sign a non-disclosure contract, making it illegal to tell anyone outside of special forces anything learned while in special forces (the breadth of this relationship is not accurately defined since that is impossible). The contract was supposedly initiated to prevent further book publications where members or former members were involved. This was sound as far as security was concerned. However, the non-disclosure clause turned out to be two-pronged. Apart from seeking to prevent the writing of books, the decree was also a control over civilian employment if it required the use of knowledge and experience gained within special forces. This was immediately seen by operatives as a threat to their future livelihoods since the majority are forcibly retired by the age of forty. For most of them their military skills are all they have. Breaking the contract, which was seen as an addendum to the Official Secrets Act, could result in a fine and/or imprisonment. The DSF were quick to point out that the contract did not mean a man could not do a related job on leaving special forces, it just wanted control over who did what for whom and where. The DSF proposed an organisation, run by people appointed by the DSF that would centralise, assess, and then disperse suitable civilian job offers that required the skills of former special forces operatives. Anyone with a pinch of imagination could see the idea was as flawed, hypocritical, narrow-sighted and unfair as the people who came up with it. One of the more obvious disadvantages for the SBS of this central jobs office was that it was manned mostly by former SAS operatives who, naturally, looked after their own (SAS) first. This became a bit too obvious when certain water-oriented security jobs went to former SAS operatives who couldn’t tell the difference between Boyle’s Law and an egg recipe. The DSF went on to threaten that any member who did not sign the contract would be kicked out of special forces. Many SBS operatives said they would not sign on principle until their considerations were noted and the contract amended. They were ignored, and by the time the deadline to sign arrived, only two SBS members, two senior NCOs and highly respected individuals, remained steadfast in their threat and refused to put their mark on the paper as it was written. The DSF booted them out without review or court martial. To my knowledge, neither of the men planned to write a book or teach special forces techniques abroad. One of them recently moved to Russia to run security patrols on a river owned by a fish company, and the other is a published poet. While in pursuit of opinions on my proposed book, I visited a friend at his house one sunny weekend. Stan, a lieutenant who made his way up through the ranks having served some eighteen years in the Branch, was digging in a complex web of pipes throughout his garden. He was putting together an automatic sprinkler system so that in future, when he was called away unexpectedly, and no matter how long for, his lovingly manicured flowerbeds would get all the water they needed. As he put the finishing touches to the system, he explained his argument in favour of such a hypothetical book, hypothetical because the DSF even made it an offence not to report even the suspicion that such a book was being written (it was all beginning to feel a bit like a ‘Tolpuddle conspiracy’). Stan’s reason was sponsored by the experience of another SBS member, or to be more precise, of his children. Apparently his two boys had been getting a hard time from school friends because their dad was in the SBS, a unit, the friends claimed, that was not really special forces and whose members did nothing other than paddle around in boats all day. The friends also claimed the SAS were the tops and the only special forces unit worth being a member of. This was obviously due to the spate of books, TV shows and press coverage the SAS was getting. It was upsetting for the children, who even began to show signs of doubt about their dad’s importance. Stan felt it was about time at least one book by an SBS operative told the facts. It was not the best of reasons since it was purely ego-driven, but it made the list of considerations. Stan’s own footnote was that he wholeheartedly believed it was far more demanding to get into the SBS than the SAS, both physically and intellectually, because of the selection process and nature of the job. With that, Stan tightened the last nut on the sprinkler system. ‘And now for the moment we’ve all been waiting for,’ he declared as he went into the house to turn the water on. He joined me as the first sprinkler heads spluttered to life, forcing the air-pockets from the pipes one after the other in quick succession. ‘Who needs a plumber, eh? Just takes a bit of ingenuity and intelligence,’ Stan said, tapping his cranium to reinforce his earlier point about the superior intelligence of the SBS. Suddenly, we noted steam coming off the sprinkler heads and spreading to the grass and flowerbeds. The water had turned boiling hot. Stan had accidentally plumbed into his central heating system. As he charged into the house to turn the water off, I decided it might not be wholly accurate to claim the superior intelligence.